I spent ages trying to decide if I actually liked this photo or did it just look too unreal not to be faked. Basically, the sky is exactly as it came out in the camera, I did slightly adjust the contrast but apart from that it’s simply down to pure luck and a very large dose of patience. I think I spent over an hour hovering over the camera waiting on some kind of decent cloud cover to appear, at the same time as the sun. They say you need patience to photograph animals in the wild, well let me tell you, just because trees don’t move around you still have to do a lot of waiting / stalking. I have always loved this particular collection of trees, I have visited them many many times during the course of many different seasons and lighting situations. I have never really been happy with the photos I have taken and it was on this cold september day that I finally approached them from a different angle and found this cute little bridge just begging me to include it in the shot. I duly obliged and I should really go back to that wee bridge and thank it for all the help. Well worth a walk through some very soggy ground. I love this particular spot during the summer, it’s just a perfect place to hide away from the world. I spent ages trying to decide if I actually liked this photo or did it just look to unreal not to be faked. patience to photograph animals in the wild, well let me tell you, just because trees don’t move around you still have to do a lot of waiting / stalking. her for all the help. 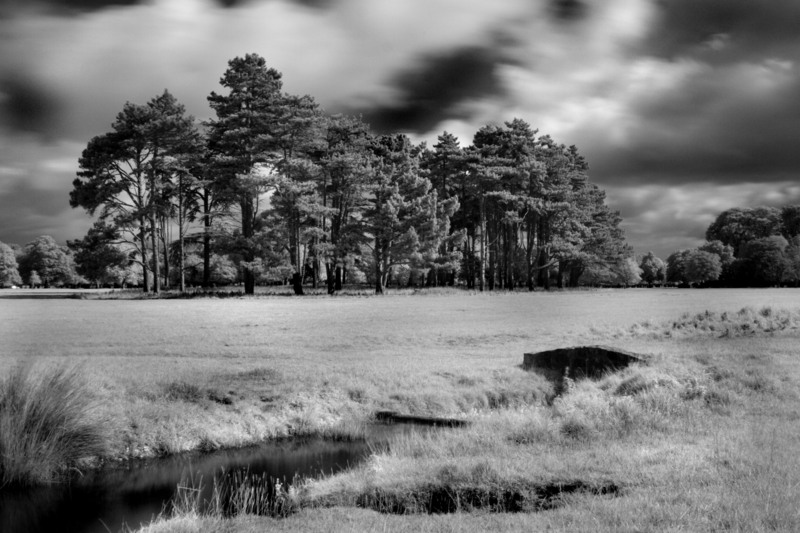 This entry was posted in Black and White Photography, Infra-red Photography, Irish Landscapes, Phoenix Park and tagged Infra-red Photography, Phoenix Park, Trees. Bookmark the permalink. ← The Less Friendly Trees.